These sheep were something else. They were unlike the others we had come across- they didn't sprint off in a panic as we approached. The look on their faces was one of total indifference as we cycled passed. One had its legs stretched out in front and I had to swerve to avoid them. A lamb was lying flat out asleep, inches from the road, and did not even flinch as my wheels rolled by. The only active bundle of wool among this gang was deeply engrossed in scratching its backside on a gate. Perhaps the reason the sheep were so relaxed had something to do with the magnificence of the landscape where they undertook their grass munching. My reaction to this vista was a feeling that my eyes would explode with the beauty that they were being treated to. 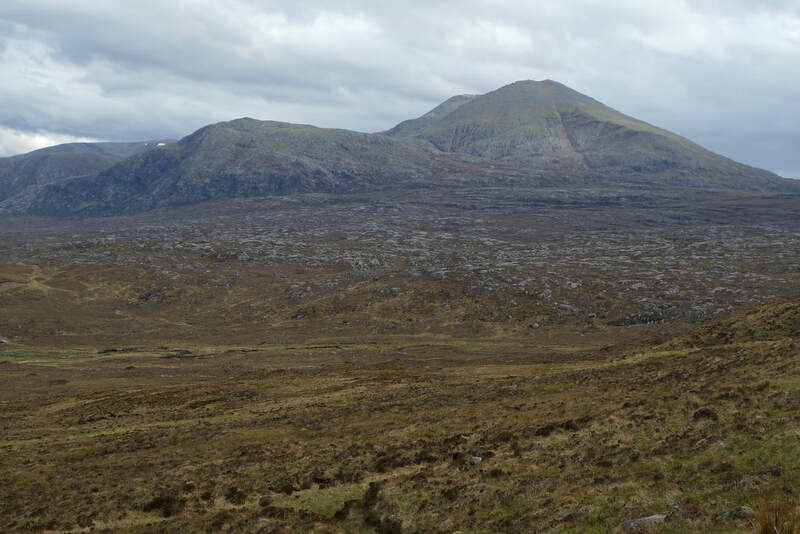 We were travelling from Durness to Kinlochbervie after spending the day on Cape Wrath where I thought the scenery could not be surpassed, but I was overwhelmed by what I saw here. There were mountains all around us of different shapes, colours, sizes and heights. There is only one house on this road and I couldn't help but imagine living there and having this all to myself, undertaking a morning ritual of a coffee in front of this panorama. 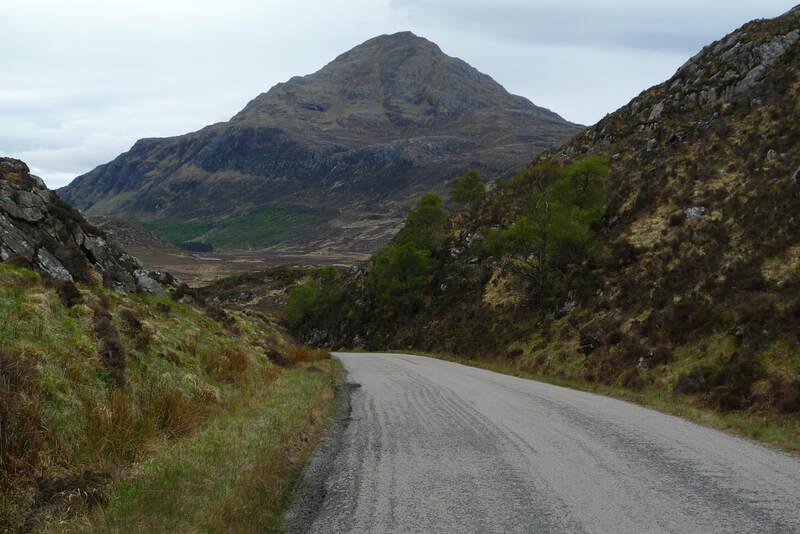 To reach Kinlochberive there is a glorious twisty road that climbs up alongside Loch Inchard, with its myriad of inlets, and velvety hills. It made me think of Norwegian fjords. The final descent to the village is an immense downhill. From the top it looks a bit like a waterslide heading straight into the sea. After my meal I went out for a walk down a field to the church, accompanied by the sounds of bleeting sheep and an overhead racket of honking geese. It was wonderful to be able to stroll at 9pm when it is not yet dark and there was nobody around. It is one of those things that I never do at home, but love to do when I travel. The next morning the wind was whistling through an unseen gap in the window- an ominous sign of the road conditions. Our destination was Lairg for the train home. For the first 10 miles or so we were buffeted by strong gusts as we pushed along a road fringed with rocky ground. It was far from the knockout scenery of yesterday, but these rocks are not just any old rocks, in fact they are the oldest rocks in Britain. This is Lewisian gneiss and is found mainly on the islands of the Outer Hebridies, but also this part of the mainland. 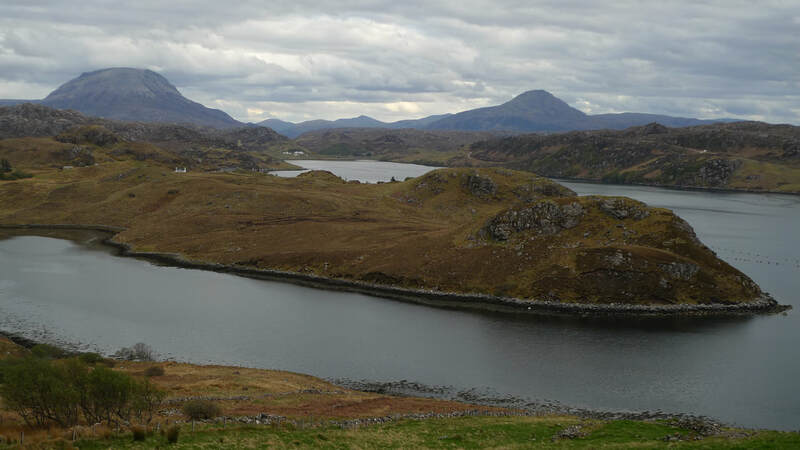 A left turn at Laxford Bridge took us past a series of lochs. Loch Stack. Loch More. Loch Merkland And the biggest of them all- Loch Shin. At 17 miles it is one of the longest lochs in Scotland. 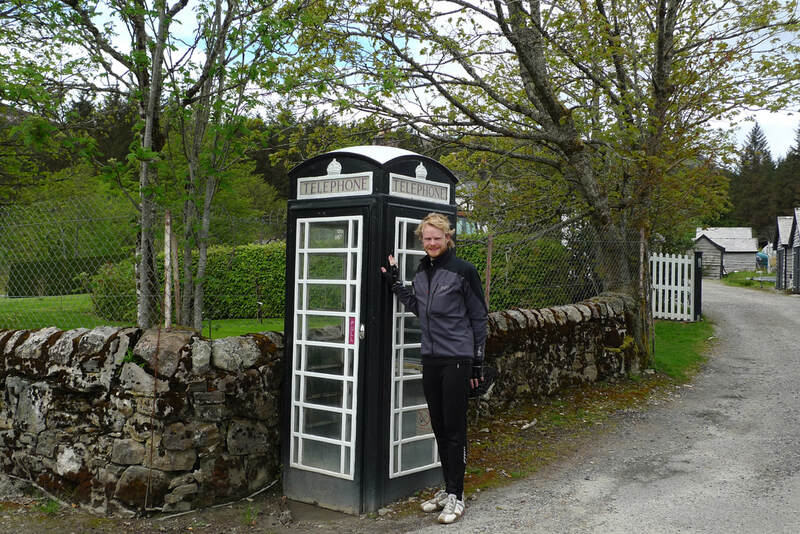 The Post Office had granted permission for the 'phone box to be painted in this way to fit in with the estate buildings. In 2008 British Telecom wanted to remove the telephone because only three paid calls had been made the previous year. but the Duke campaigned successfully to save it. With the exception of tiny Achfary there are very few signs of human settlement. Along the empty expanse of Loch More a single house on the opposite shore is the only visible habitation. Behind the house there is a gouge in the hillside where a waterfall tumbles. I stared for along time at that place trying to spot a road to it and could see nothing, so how on earth do people travel there? Reaching Loch Shin I heard crying. "Stop!" I shouted to paul. A lamb had its head caught in a fence. I tried to prise a gap in the fence and encourage him to back up, but he kept coming towards me. Paul appeared and pushed the lamb's head back through the fence and it scampered off to snuggle against mum. 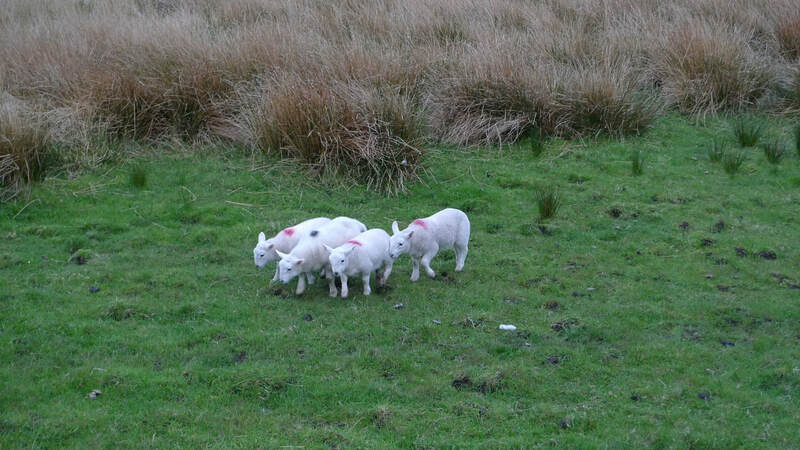 When we got back on our bikes again the sheep and its lamb started walking over to us. Normally sheep run from people, but this was like they were coming over to thank us for the rescue. That's what I thought anyway. You know a place is really rural when your road map has a hotel marked on it. In urban areas hotels are everywhere, but in rural areas they become landmarks when positioned on long expanses of road where there is nothing else. The Overscaig Hotel is a little piece of comfort and civilization when you are getting battered by the wind on the lonely Loch Shin road. Comfortable chairs, a wood burning stove and scones and jam provided a few minutes of bliss. The only other customers were two farmers discussing the type of dye that they use to mark their lambs. I figured that they would be unimpressed by our sheep saving heroics. It is the mountain views, some with snow caps, that enlivened the Loch Shin road with its relentless rugedness, isolation and tracts of commercial forestry. Fighting against the unrelenting wind had taken its toll on our knees and we were not sad to leave this place and reach Lairg. There was time for a browse in The Sutherland Sporting Tweed Company. Opening the door we were immediately met by the scent of tweed cloth. Choral music was playing on the radio and the room was wood paneled. It was like taking a step back to an era when small towns were well endowed with shops like this and people did not travel to the nearest city for their needs. They specialise in made to measure hand tailoring of Scottish tweeds and the shop is crammed full of coats, jackets, trousers, waistcoats and hats in different designs. We took dinner at Crofters where I had macaroni cheese and Paul took the venison pie. The food was excellent and set us up for the long train journey home. We reflected on our day, the energy sapping wind, the enormity of Loch Shin and wondered if that little lamb was staying clear of the fences. This is the final part of a cycle journey with my friend Paul. Part one began at the isolated train station of Kildonan. I travelled here as part of a four day trip starting at Kildonan. You can read part one of this journey for travel details. Otherwise you could do this trip in reverse by taking a train Lairg. 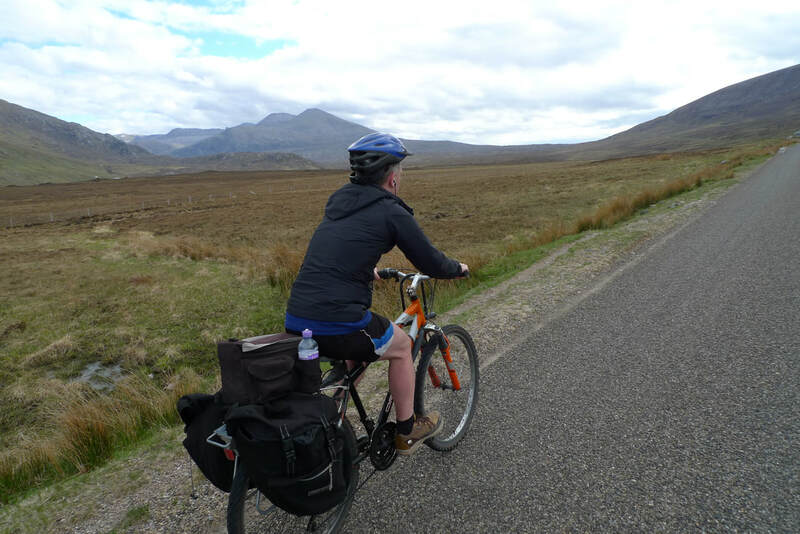 There is also a summer bus service with a bicycle trailer that travels from Inverness to Durness. It is about 18 miles from the Cape Wrath ferry pier to Kinlochbervie. From Kinlochbervie to Lairg is 50 miles. The route is mainly by A-road, but it is mainly single-track with passing places. Traffic volume is generally low. There are hills on this route. Mountains, lochs and epic landscapes. Apart from this there are no specific attractions. 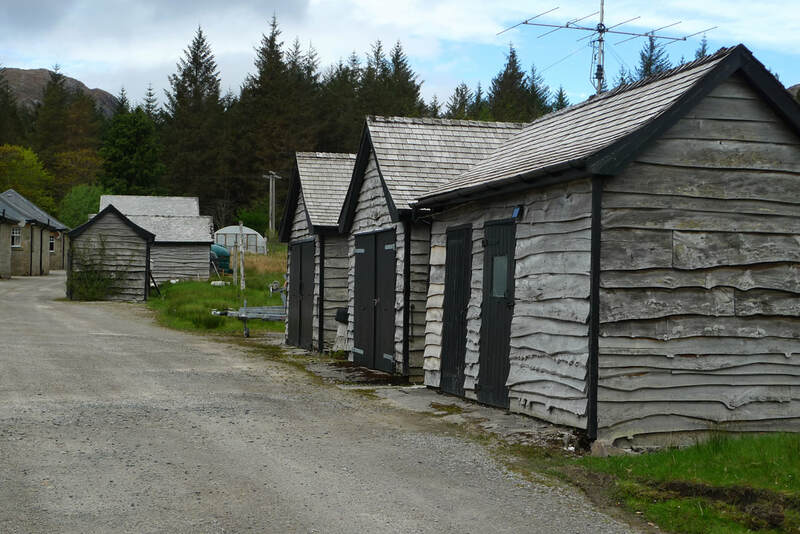 In Lairg there is the Ferrycroft Visitor Centre that explores the heritage of the local area. Have a look at The Sutherland Sporting Company for all of your Tweed needs. The Kinlochbervie Hotel is a little old fashioned for my taste, but the rooms are comfortable. The Overscaig Hotel is the only place for food and drink on the road between Laxford Bridge and Lairg. In Lairg Crofters Restaurant is recommended for home-style cooking.